Players and programmers include Al Eaton (Queen Latifah. Ice-T) , T.E.T / Anthill Mob / Tom-e, Andrew Small (Kylie Minogue, Massive Attack, Courtney Pine), Shane Meehan (Definition Of Sound, Microgroove), Martin Steib (Papa Brittle), and Dave Spiers. HIP-HOP (94), FUNK (56), DANCE (50), JAZZ (25), GENERAL (65), DRUM & BASS (71), SNARES/HI-HATS (85), CONGAS (15), MISC/FX (48). 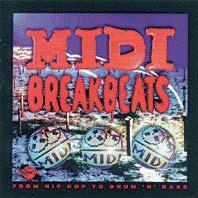 More than 400 individual breakbeats make up this essential library of breaks and more that have been played or programmed by some of the top names in US rap/hip-hop and European drum & bass scenes. One of the company�s best-selling collections these loops do not sound like MIDI, and range from classic 75-90 bpm rap grooves courtesy of the godfather of East Bay hip hop Al Eaton to 160 bpm speedfreak drum �n� bass loops from T.E.T. These are dance beats; challenging ones with plenty of fire and excitement built in. �How good are the patterns? Darn good. I have fooled many listeners into thinking I'd lifted a breakbeat straight from an old LP by using a combination of popping vinyl noise from E-Mu's Planet Phatt module and a T Bits Drum Pattern" Keyboard Magazine.